Home > Business • People & Interviews > Pen-Tastic Future for Teen Entrepreneur! As a recent college graduate with a Business degree, I should know a thing or two about business. I could be the next up-and-coming entrepreneur, right? Wrong. I couldn’t tell you what I ate for breakfast this morning, let alone how to run my own business. Yet, after speaking to 13-year-old Anna Williams, there may be hope for me after all. Anna Williams is wise beyond her years. As the proud owner of Pens Ink, Anna has established herself as an entrepreneur within her community and beyond for the past three years. When Anna was just 8-years-old, a random YouTube video sparked her love for pens. Anna was shown a video by her father, Michael, of a teenage boy creating his own pens, using a lathe. Anna’s immediate reaction was, “I want to do that!” Yet, despite her constant pleading, Michael refused because, as Anna put it, “A lathe could kill you!” But as the motivated, driven young lady that she is, Anna relentlessly bothered Michael for the next two years. After years of begging, Anna turned 10-years-old and Michael finally gave in. Michael bought Anna her first lathe, and Pens Ink was soon born in 2011. 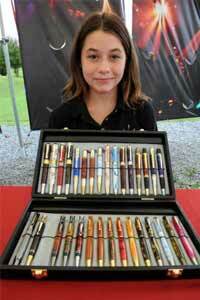 Working out of her dad’s basement in Glenville, NY, Anna devotes her time to school, friends, and making pens. Now in her third year of business, Anna says 2014 is the busiest year yet! Now you may be wondering, how in the world do you make a pen? 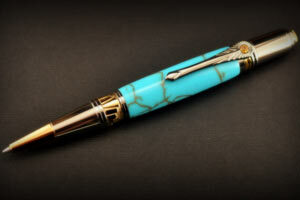 The teen creates her handmade pens on a lathe, a tool that one can turn various items on. The lathe rotates the material on its axis, allowing the user to perform a variety of operations, like cutting and sanding. Anna began creating pens using wood, placing it on the spindle of the lathe, which allowed her to chisel and carve the wood. Now, Pens Ink offers more than 175 varieties of exotic and specialty woods, historical woods, acrylics and stone! If that isn’t cool enough, Anna doesn’t JUST make pens. She has branched off into mechanical pencils, wine stoppers, and even purse hangers. All of Pens Inks products are hand-turned, which allows each piece to always be unique. Her products range from $33 and upwards, depending on the features and design. You many be wondering, how long does it take to make a pen? On average, anywhere from 45 minutes to an hour, Anna says. While Anna makes sure to take her time when creating all of her projects, certain materials are more difficult to manipulate than others. While Anna does create pens on her own, she never forgets to mention the help she receives from her dad, Michael. He assists Anna in anything and everything, from helping her finish out orders, to the financials, to her website. Through his constant support and help along the way, Pens Ink has been able to continue growing to this day. Recently, Anna has formed a collaborative partnership with Northeastern Fine Jewelry in Schenectady, NY, who will be providing metal components for her pens, using silver, gold, and platinum. Using these precious metals, Pens Ink will be creating a new line of premium pens and moving into a whole new market. Through this partnership, Pens Ink and Northeastern Fine Jewelry will collaborate to design an exclusive patent pen. several landmark sites, allowing their clients to create new products out of the otherwise wasted resource. 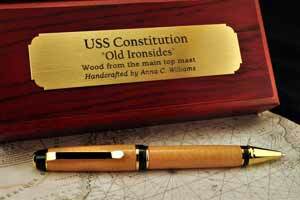 Anna has a variety of historical wood pens made of woods from estates including George Washington’s Mount Vernon Estate and Thomas Jefferson’s Monticello Estate! Anna also uses historical wood from local sites such as the Brookside Museum, the Vischer Ferry Nature and Historic Preserve and many more! pens, I wanted to know what else she loves about being a business owner. As an outgoing, humble, and mature teen, I wasn’t surprised when Anna said meeting people. 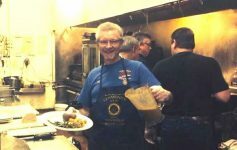 As a member of the Saratoga Chamber and Southern Saratoga Chamber, Anna makes sure that she gets to meet and greet with everyone that she possibly can, creating connections and relationships. When she first began her business, Anna admits that she wasn’t taken seriously at Chamber events. Being a young 10 years old, she didn’t feel that members found her business as a serious, lasting venture. 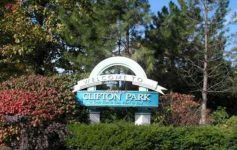 Yet after 3 years of success, she continues to gain respect as a business owner, largely due to her mature nature and never-ending drive to succeed. As Pens Ink continues to grow and prosper, Anna doesn’t deny the fact that this becomes more of a challenge for her. Their top priority as a growing business is to focus on organization and determine where the business is going. Yet, Pens Ink seems to be right on track! Anxiously awaiting her first laptop, Anna explains having her own laptop will allow her to respond to emails in a more timely fashion and fully organize her future plans. While there is never a day that Anna is not talking about pens, I wanted to know what else Anna enjoyed. 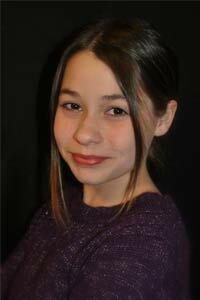 Currently the teen is not involved in any sports, but she used to be a competitive figure skater and also participated in karate and dance. This summer, Anna admits to being somewhat of a couch potato, enjoying her time off from school by relaxing and spending time with friends and family (I approve!). During the school year, Anna focuses on school work and driving her business forward. Anna is optimistic that Pens Ink will continue to grow and expand for many years to come. In the future, Anna sees herself as a business owner, enjoying the independence of entrepreneurship. With hard-working, determined owners behind it, Pens Ink’s future looks bright. Pen-tastic, in my opinion! To learn more about Anna and Pens Ink, check out Pens Ink’s Facebook page and their website, Pens Ink.com. Next Article Massage Studio Opens for Business!